Rhinestone Barrettes add a glamorous flair to topknots. Rhinestone encrusted designs provide a sparkling finish to any dog's hairstyle. Feature elastic backs for easy attachment. 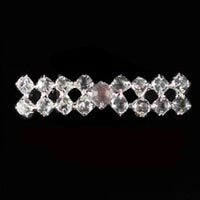 Classic Rhinestone Barrettes measures 1 1/4"L x 1/4"H.